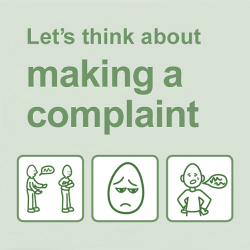 Raising your concerns and Complaints about the services that you receive is important to us. Talking to us about how we are doing will assist us in making improvements in what we do. We would encourage you to raise any concerns direct with the staff who support you. Our staff understand that when you raise concerns it is a way of gauging our input and quality and they would wish to resolve matters with immediately. However If matters are not resolved and you would like to discuss any concerns that may have we would be happy to meet and discuss them with you - please call us on 01726 810045. We believe that the majority of complaints can be resolved locally and we will do everything we can to make sure this is done effectively and speedily. If in the event that for any reason this is not possible and you would like to raise a formal complaint then please click on the button below and this will guide you through our complaints process. If you wish you can also raise your concerns with our regulators Care Quality Commission (CQC) 03000 61 61 61, enquiries@cqc.org.uk On their website there is an online form that you can complete.